MOST IMPORTANT - ALL ENTRIES WILL BE CHECKED. IF YOU HAVE LIED ABOUT EVEN ONE OF YOUR ENTRIES AND YOU WIN (THE WINNER IS DONE BY RANDOM NAME GENERATOR) I WILL CHOOSE ANOTHER WINNER AND YOU WILL BE DISQUALIFIED! 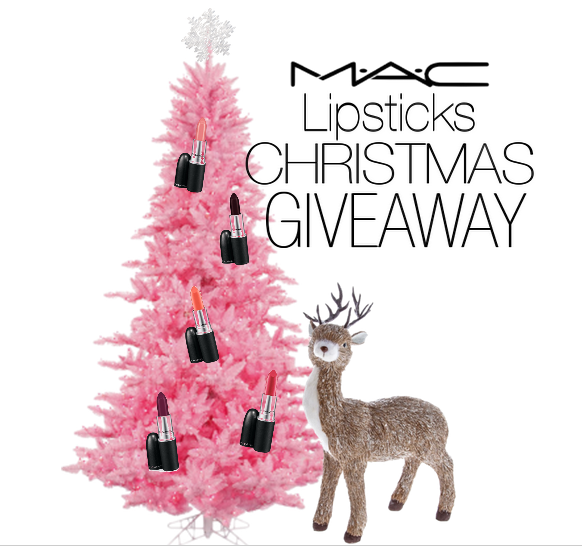 What more could you want than MAC lipsticks dangling off a pink Christmas tree? Thats why this Christmas one of my lucky and lovely readers is going to be winning TWO MAC lipsticks of their choice! Yes thats right one of you reading this (perhaps you) can win two lipsticks in the shades you choose. There will be no delivery fee of course, that is paid by me. The only information I will need from you is your address to post them to you. Of course I will ask for them over something private like email. The winner will be announced on Christmas day, a little Christmas gift from me. To enter you must or must start following me on Bloglovin, you must also be subscribed or subscribe to me on YouTube. Other entries for that edge to win include, following me on Instagram and Twitter. For a better change to win there are 14 entries in total, why not do them all and get yourself those two lipsticks you've been lusting over? Thanks for the chance!I like reviews and tutorials! Would be a great Christmas present indeed!the posts I like to read the most are favorites! I love reading reviews and make-up looks/tutorials :) Thanks so much for the lovely giveaway! I love makeup reviews with swatches and demonstrations ! Thanks so much for the chance ! Thank you for such a great giveaway lovely, it would be an amazing Christmas pressie! :) I love reading makeup reviews and hauls! I love to have a nosy to see what others have brought! I like reviews of big makeup palettes and shower gels. Done All! Thanks a lot! I love Hauls, Reviews and Lifestyle posts!!! I'm crazy about her lips! Love her lip color. Nice to know the dupes! I really love MAC!! I hope to be lucky! I love hauls thank you for the chance! I love reviews as i know which products are worth buying & not waste my money. I think my all time favourite blog posts to read have to be Hauls and Beauty reviews! Thank you so much for such an amazing giveaway!